beautiful composition, love the exposure and the low angle on the perspective. 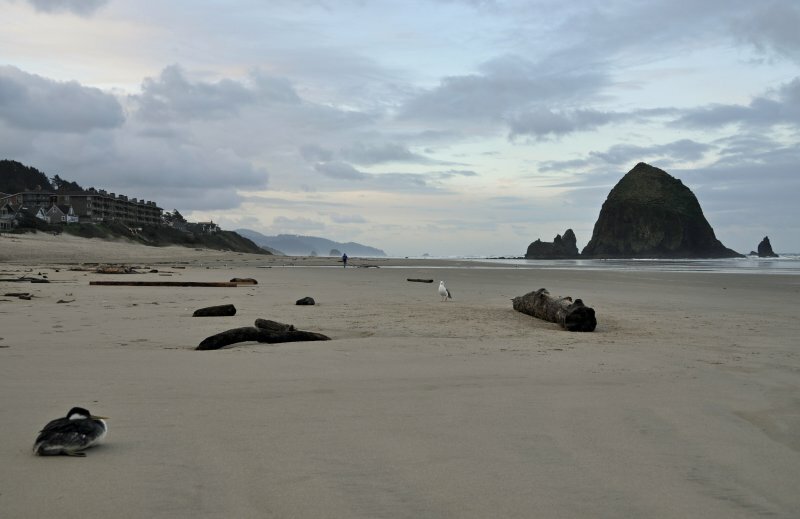 It's a lovely little town and did you make to Cannon Beach? Masterfully composed, with many scattered things which catch so well the eye. BV. Perfect beach to stroll and relax...splendid perspective! Love the early light. Outstanding! V.
Excellent mood and composition. V.
I like how you divide the sky and the land . The nearly deserted beach looks so peaceful...beautiful! Very good pov and light! V! A wonderful scene with lots of play in the sky. Breathtaking view of this sand and seascape. The rocky formation nearby adds special interest to this magnificent shot. A beautiful scene. I have a pic almost like that but with more fog. Nice work on this! Great scene, the birds look pretty chilled about you being there. Great tonal range; love your POV; it give this magnificent scene great depth. excellent compo, lovely birds, great depth, view David. Great shot with this low perspective. Very nice details, cloudscape and lighting. "V"
The duck is enjoying like you this magnificient view along the coastline! This is a promising start of an interesting photo series about a trip just across the border! :) V.
Some breaks in the cloud I see David, this is a great place the sea stacks are so interesting, lovely shot.